There were churches that have left no record behind. Veteran preacher John M. Harris wrote in The Christian Record, "I held a meeting on the Rogue River, and had seven additions, -- one of whom was a local Methodist Preacher; his wife and daughter were also of the number, -- and the prospects good for many more." The only place that comes close to matching is the camp ground near Central Point. Ruth Wood describes it in the entry under Central point. This village was probably named in honor of Lindsay Applegate, one of the three Applegate brothers that explored the valley. In 1871 a group of believers was meeting here because they reported having 17 members to the Christian Messenger. If the church was still active 25 years later, Ephriam Badger and his family would have been a part of it. Ephriam preached in Oregon, Washington and California many years before settling a nearby Provolt. Ephraim and other members of the family are buried at the Missouri Flats Cemetery. There is a profile of Ephraim Badger. This community faded away many years ago, but in 1871 a congregation of 11 people reported their presence to the Christian Messenger, published in Monmouth, Oregon. Elder Martin Peterson had a farm in the area and may have been responsible for establishing this congregation. See Oregon, A Short History of the Churches of Christ by John G. McKeel, page 14. There is a profile of Martin Peterson. There were two other Antioch congregations in the state. One was an older name for the Sheridan Church in Yamhill County and one was in Marion County. The Antioch Cemetery is on Antioch Road, just north of Highway 234. It is about 10 miles north of the Medford Airport. The community would have been very close to the cemetery. This is a third congregation to appear in the records of 1871, but to have 50 members that year, it had been established much earlier. In a listing of churches for 1871, the Christian Messenger, published at Monmouth, Oregon, lists the church as being in Jackson County, but spells it Manzanita. It is almost certainly the work of Martin Peterson. The church met on Old Stage Road, west of present-day Central Point. The Manseneta post office was very close to the intersection of Old Stage Road with Scenic Avenue. In close proximity was the later settlement of Willow Springs. 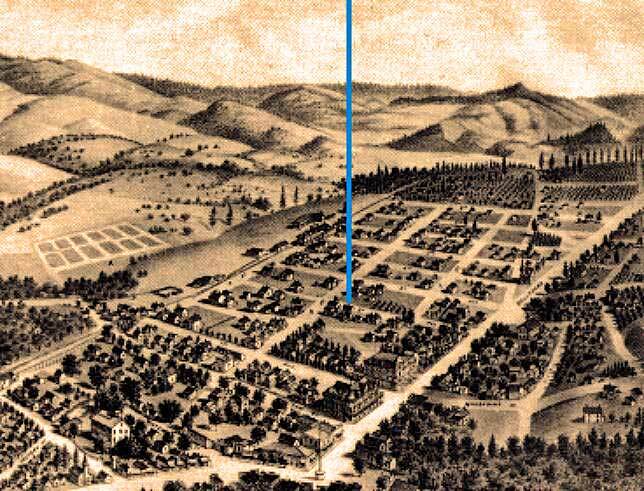 Ashland was named after Ashland County, Ohio. At first it was known as Ashland Mills because of its flour and saw mills, but was shortened to Ashland in 1871. From 1885 - 1916, Ashland was the site of a toll gate for the toll road leading over the Siskiyou Mountains to Hornbrook, California. The road, now Interstate 5, was a one-lane wagon road with turnouts operated by the Dollarhide family. Martin Peterson established a work in 1871, but it did not continue long. In fact, two unsuccessful attempts were made to organize a Christian Church here prior to 1898. Circuit-riding preacher E. W. Barnes reported from Ashland in 1877. There was a church meeting that year. Preacher F. E. Jones reported to the Christian Standard of January 3, 1891, that he had a few families meeting. He wrote, "We have no church here, but a few brethren." In 1898 five men met with E. D. Washburn and it was agreed to meet in the Chautauqua Building to hold a series of Gospel Meetings. Seventy-five people were present in the Chautauqua building with Evangelist John B. Lister preaching. Between eighty-eight and one hundred continued to meet through the week. The church was then organized with the Elders doing the preaching through the summer. By September, the services moved temporarily to City Hall. In 1899, they moved to the Opera House. Sixteen members were added to the original thirty-two that first year. The first building was constructed early in 1900. The property where the church built can be seen on a panorama. Among the charter members were Mr. & Mrs. F. M. Blevins, Arthur Blevins, Mrs. Delphi Bryant, Leah M. Caldwell, Beulah Caldwell, Mrs. A. S. Cloyd, Bert Davis, Mrs. Davis, Miss Clara Davis, Mrs. A. Emery, Mr. E. E. Faulconer, Alfred Faulconer, Mr. and Mrs. D. L. Harris, Mrs. Irene Herrin, James Kelly, Mrs. Kelly, Miss Anabel Kelly, Mrs. E. Miles, E. Miller, Mrs. M. Morgan, Miss Bessie Peed, Mrs. M. E. Riley, Mrs. A. J. Roach, F. D. Robbins, Ella Stone, Cora Stone, Mrs. R. C. Stone, L. R. Ulen, Elmer D. Washburn, and Miss Iva Washburn. It was located at 2nd and B Street. on the other end of the building. The purpose of the church remains what it has always been: to lead others to Christ and to provide nurture for those already dedicated to Him as Lord. We are part of a movement to restore the New Testament Church by reproducing in these modern times the same Name, Creed, Memorials, Organization and Sacrificial Life and Love as was manifested in the Church of the first century. We are dedicated to nondenominational Christianity, believing that when we stand on universal ground we stand on original ground. We strive to be Christians only, although we are not the only Christians. According to an unpublished paper by Keith Kimball, J. F. Trout was the minister selected in 1898. Among the early ministers was G. K. Berry who became very active as a Christian journalists in Portland. Named Central Point because two important wagon roads crossed here, a post office was established about 1870. C. F. Swander reports the origin of the congregation was in 1893, but preaching was going on much earlier. During the early days of old Central Point the only church services that were held would be during the summer months at the old Camp Ground on Rogue River just below the Bybee Bridge. There were about two acres of ground being in an oblong shape. The ground was covered with oak and cottonwood trees providing shade all day long. The west end of the grounds was for wagons and horses while the meetings were held near the center of the grounds. Arriving about 10:00 o'clock A.M., the horses would be unhitched and tied to the trees. Church services would commense at 11:00 A. M. and last about one hour. After services closed, a dinner would be spread on long tables kept for that purpose. At 3:00 P. M. preaching services would be held again. This was a beautiful place for meetings but in the winter of 1890 a snowfall of 2 feet deep melted rapidly causing the streams to go out of their banks. Acres of good river soil were washed away including this camp ground. The first preacher here was circuit-riding Martin Peterson. Another was L. M. Jones who left Central Point for Gridley, CA in 1895. A church building that was shared by the Baptists, Methodists and Christian Church was built between 5th and 6th on Manzanita Street. The shared building idea may not have lasted very long because the Christian Church was reorganized in 1903. The next year the people built their own building on the corner of Oak Street and Third. It was the north corner of the intersection, the town being at an angle to north. The name was later changed to The Church of Christ. The first minister of the new group was Mattey (T. M.) Jones. Medford was once known as Chaparral City. Martin Peterson, a pioneer of 1864, with his wife Elizabeth, organized this congregation in 1884 (about the time the name was changed) and remained as its leader until his death in 1889. Teaching began as a Union Sunday School, meeting in a school building and adult services combined with the Presbyterians in a hall over Charley Walter's Grocery Store. In 1884 Edith Webb and her five grown children wanted a Christian Church and on November 24, 1884 services were launched in the home of E. D. Elwood at 135 S. Central. 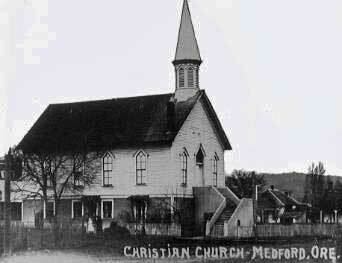 This was the first church started in Medford. Charter members were Margaret Darwell (she later married Eli Fisher), Mr. Higginbottom, Mrs. Anna B. Higginbottom, D. H. Miller, D. H. Taylor, Mrs. Taylor, Mr. & Mrs. G. S. Walton, Benjamin Webb, Edith Webb, George Webb, Hattie Webb, Isaac Webb and Laura Webb. Over the next several years, the church met in several places and finally the Oregon-California Railroad donated a lot for each church in town. The Christian Church was given property at the south corner of W. 6th and N. Ivy. This was just one block from the Jacksonville Road. Medford had a population of less than 2,000 then. A two-story building was erected in 1889. Martin Peterson lived to see it. While preaching a sermon on June 30, 1889, he was stricken and died the next day. 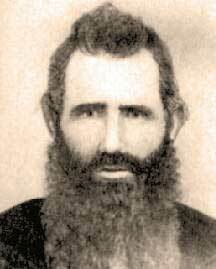 J. H. Deboy of Gold Hill led the congregation immediately following the death of Mr. Peterson. We have a nice little congregation at Medford, but are poor in this world's goods, but we hope for more prosperous times. Among the early ministers of the congregation was Eli Fisher. Mr. Fisher was born in Tazewell Co. IL. He was a graduate of Eureka College and also attended Bethany College in West Virginia. He married Anna Bradbury, a student from Abingdon College. Mr. Fisher had preached in Missoula, MT and Dallas, Oregon before moving to Medford in 1895. After the passing of Anna, he married Mrs. Margaret Darwell of Medford in 1930. He may have lived out his remaining years in Medford. 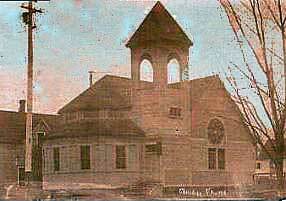 The church relocated in 1912 to a new building at Oakdale Avenue S. and 9th Street West. That segment of West 9th has been abandoned and a large office building is now located there. The church occupied the east corner of the intersection. The carefully constructed church house was like a large, expanded home rather than a conventional church building. This Disciples congregation has moved to a more spacious location since these pioneer days. Elder Geo. M. Whitney, whose home is here in Eugene, spends his summers in Southern Oregon, developing a gold mine, but all the while preaching at points near his mountain home. Last Lord's day he held services at Gold Hill, with 13 accessions. The 13 were added to an existing congregation. By the following August, more than 30 others had been added. Oral history has it that preacher Ephraim Badger used to walk over the hill from Provolt to Gold Hill to preach for the Church of Christ there. Martin Peterson also reported preaching with some regularity at the Heber Grove School, three miles east of Jacksonville. This happened over a period of years. Likewise, there was preaching at Eagle Point and Phoenix.